If you're not already using audiobooks as a knitting aid, you should seriously look into it, because they can be pretty fabulous. I've been a bit slow to get going on them but some knitters swear by them, especially for times when you want to be entertained but can't be looking up from complex work to view a TV screen or a game or something. Others love them for long commutes. What got me moving was my loom, because OMIGOSH: weaving. Such a great idea, so incredibly boring to do for hours at a time, unless - maybe, I couldn't say from experience - you're doing an interesting pattern or have a really good chair such that your back doesn't ache. Sadly, the system never really took, because the technology I was using to play them was kind of ill-suited to pausing the story two seconds after the password lock kicked in, which seemed to be every time I wanted to pause the story. Also, the maximum volume would have been ideal only for somebody sitting in a corner of a library hoping not to be noticed. Now I'm using a tablet and it is fabulous for audiobooks. I can hit pause and play and up the volume, which is actually loud enough to hear from the counter while I make supper or from the table as I work, without having to type in the password at all. YUM. The upshot: I haven't been knitting a lot, but my house is tidier than it's been since I moved in. As it turns out, when somebody's reading to me it turns out I'm quite happy to clean and organize and not read endless websites or sneak off to watch movies. And at a certain point of housekeeping, you are going to Find Things. There has been a bag of knitting sitting at my desk for about two years now. I keep moving it without opening it. Guess what was inside? 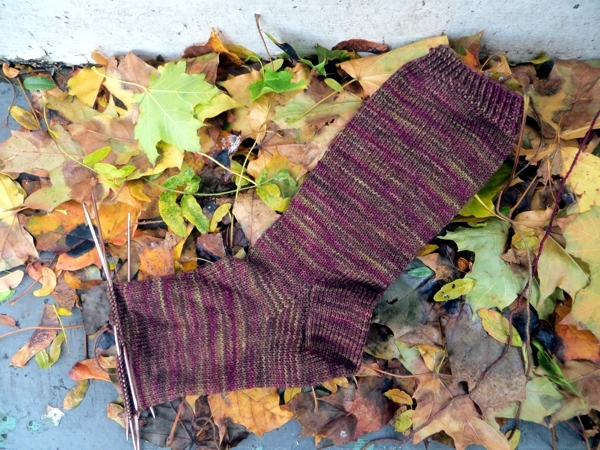 almost a whole sock! 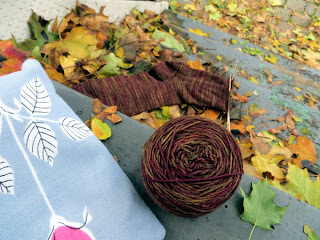 And not just any sock - a Viola-yarn sock. It's in the 'gnarled' colourway I mentioned the other day, and it's so soft you would put it on and wear it even with the needles sticking out of your shoe. I remember now what the problem was with these socks. I was knitting them on 2.25mm square needles - they must have been the first pair I knit on squares, and this is how I discovered I am one of the knitters who has to go up a size when using them. This sock was a tiny bit snugger around the bend than I like, and I guess at the time I was debating whether to rip back and make the heel flap longer. The other resulting problem was that they were going to be too short if I knit my usual number of rounds between gusset and toe, but I wasn't sure how many rounds to add in. Now of course I have enough emotional distance to commit to measuring everything out and moving forward. Yay! I can't wait to wear these babies. Speaking of plural, coming to this conclusion led me to track down sock #2. Oh dear. I guess I knit these before I figured out I should always knit both socks concurrently? Hope your knitting goes without any hitches today and I'll see you tomorrow with another Discovered Knit, and some audiobook recommendations. heh heh Di... I don't know why I'm not knitting more with mine, but the deadline knitting has piled up so much it's almost messy enough to count as housework and maybe that's the tipping point!